When it’s GOOD to be SALTY. As many of you know, I served in the Royal Navy for 17 1/2 years. That half year is so important, because the last six months was really difficult. I had to come to terms with the fact that I was leaving, I wanted to leave, but there were things that you just get so used to in the Navy. There are privileges that no one, except another Matelot, would understand. You get an I.D card when you join up and that gives you instant access into any and every Naval base and establishment, but when you leave you’ve got to hand back your I.D. Card and keeping it as souvenir, memento or keepsake is not an option. As a Christian we’ve also got a kind of I.D. Card too, it gives us instant access into the presence of God. It’s instantly recognisable by Heaven and from the moment we have it God sees us as one of His own. What is it? It’s the robe of righteousness, when we are wearing that robe all Father God can see is His Son Jesus Christ. We are totally righteous in His sight, our sins are covered over in the Love of God, washed away and cleansed, He sees us as we are in Jesus; Holy, Good and Salt and Light. Therefore we’ve got access into His presence and we can come before Him with joy and boldness. No one, but a true Christian, can understand the privilege it is to have this robe of righteousness. After I left, there was no going back, no getting into the Establishments. No amount of pleading with the gate staff would enable me to gain entrance, without an I.D card I was just like every other civilian. However, when we are given our robe of righteousness, we’ll never have to hand it back again, we can keep it forever. 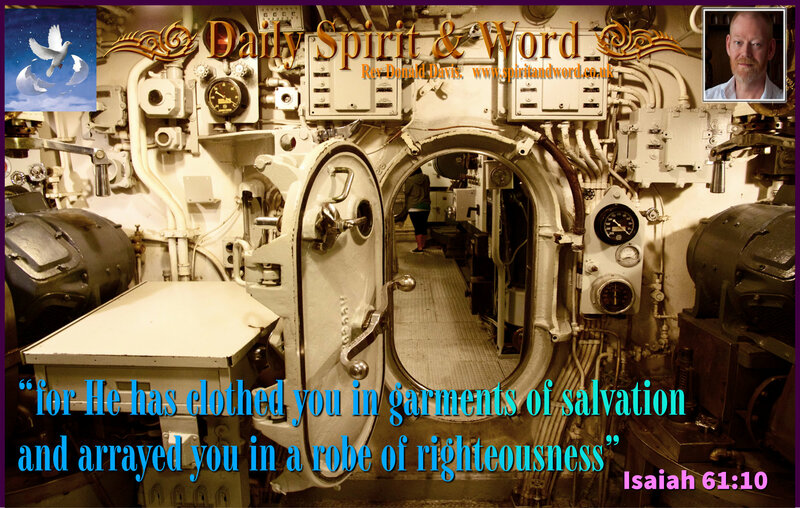 This was a verse that I sang on many occasions in the depths of the sea on a Submarine. In the heat and sweat of the Engine room or Reactor Compartment, I’d be singing my heart out to the Lord at the top of my voice. You know my friends, when you sing something over and over and over again, instead of the tune getting boring, the truth begins to impact your soul. You can DELIGHT in the LORD! He’s CLOTHED you, you are not naked anymore. You are clothed in righteousness. Think about that one for a moment, Adam hid in the garden to cover his shameful nakedness, but once you are righteous in the LORD you don’t need to hide any longer you can just come out of hiding and boldly come before the LORD, because He has clothed you in His righteousness. He has CLOTHED you with GARMENTS of SALVATION: Once you come to put your faith and trust in the Lord Jesus Christ, once you’ve REPENTED and RECEIVED Him as Lord and Saviour, you take on His garments of SALVATION and His ROBE of RIGHTEOUSNESS. Now sing it again: “I delight, greatly, in the LORD. I delight, greatly, in the LORD” Now ask yourself why you are delighting in the LORD? “Because He has clothed me with garments of SALVATION” and “Because He has ARRAYED me in a ROBE OF RIGHTEOUSNESS”. Now can you see why I’d emerge from the depths of the heat of the Reactor Compartment energised. No I’d not be contaminated with radiation 🙂 No it’s wasn’t getting those rays into my soul, but the JOY of the Lord came flooding in and when I came out it was obvious to everyone. I’ll never forget the looks on their faces. Another time, when in the Engine room, we’d been cleaning up and oil spill and it was dirty and hot, but after singing praises to the Lord I emerged onto the platform where everyone gathered for a rest and a cup of tea, and they stopped and looked at me in astonishment. I was full of joy and energy in the LORD and it was obvious to them all. I said, “Chief, I was singing to Jesus and the job became a delight”. He scratched his head. You too may be having a hard time, you might be toiling at a meaningless job, you may be experiencing the heat and no matter how hard you try, you can’t get out of the situation. Rejoice, praise, pray and sing to Jesus; His LOVE will lift you up. His presence will come into your heart and soul and you’ll be a shining light for everyone to see. Sing the song, “I delight, greatly in the Lord, my soul rejoices in my God. For He has clothed me in garments of Salvation and arrayed me in a robe of Righteousness” you’ll be coming into the throne room of Heaven. You’ll be transformed and the toil and hardship will seem as nothing. Jesus wants you to be SALTY and make a difference in the world, He’s given you access into the throne room of Heaven and when you come before Him, clothed in His Salvation and robed in His Righteousness, you’ll be full of delight and you’ll sing His praises. Let’s be SALTY for Him and let the LIGHT shine from our faces today for Jesus. It’s good to be SALTY sometimes.